Dubon practiced Saturday for the first time since being hospitalized in late February for an intestinal illness, Tom Haudricourt of the Milwaukee Journal Sentinel reports. Dubon remains a few days away from getting game action, though manager Craig Counsell has been optimistic that he'll be good to go by the start of the Triple-A season. 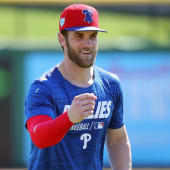 He played just 27 games at that level last season he was being shut down with a torn ACL, but a run of games with good health could put him in position for a callup later in the season in the event of an injury on the big-league club.